Advances in technology have seen the world of entertainment becoming more sophisticated and ingenious. High-tech games such as PS3, Wii, Xbox360, etc are currently the craze for both children and adults from as young as six to as old as sixty. But nostalgia sometimes takes us back to the electronic games of our younger days and we are transported to the not-so-distant past. If you miss the rather staid, repetitive and unvaried games of the early electronic days such as Super Mario, PacMan, etc, there are various sites which can unleash the memories of the past and allow you to enjoy the games again. 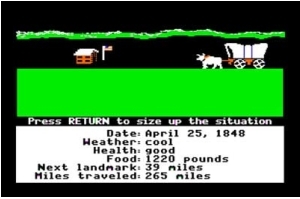 Virtual Apple is a site where users can find their familiar old classic Apple II and Apple IIgs games such as Oregon Trail, Number Munchers, Tetris, etc. Virtual Apple keeps a collection of more than 1250 Apple II and Apple IIgs series game disks online. Users can download and play these classic games through their internet web browser. This site requires ActiveX application to automatically download and play these games. To enjoy these Apple’s old games, just go to the site, select the disk from the menu and click on Yes to automatically download the ActiveX emulator and disk images in Internet Explorer and click on Install Add-Ons when prompted in Mozilla’s Firefox Browser. The classic Commodore 64 was the first home computer released by Commodore International in August, 1982. It was the best selling single personal computer model which has sold more than 30 million units and dominated the market in the early 80s. There are various Commodore 64 nostalgia games which can be found in this site. Of course another classic games library is in VirtualNEss, the largest vNES website on the internet. vNES is a Nintendo Entertainment System emulator programmed in Java. Users can find a lot of their favourite games in this site. They can search for the game either via the game title (alphabet) or publisher name. PlayNes is another online NES (Nintendo Entertainment System) emulator where users can find more than 800 original games for free. However, comparatively, the games storage is not as big as VirtualNES.